A stalwart in Rockies Prospect Primers and Organization All-Stars since he was drafted in 2015, this may be Rodgers' last go-round in an MiLB.com system rundown. If so, the Rockies will be thrilled. A bit of refinement is all that remains for Colorado's top prospect. "Pitch recognition, attacking breaking balls that he should and laying off the good ones, that has been sort of the final step with him over the course of the last couple months of last season," Rockies senior director of player development Zach Wilson said. "That was our talk in the offseason, and that's what he was focused on coming in. He took some strides in that area. I think he only struck out three times in 40 at-bats here [in Major League camp]. Spring Training numbers, whatever, except for that stuff. That type of stuff can stand out and is meaningful, and it did in his case." Rodgers will start 2019 at Triple-A Albuquerque, the same place where he ended last season with a sluggish .232/.264/.290 slash line in 19 games. Returning to the Minors' highest level, he'll aim to look more like his career line of .291/.346/.491 while also continuing his defensive evolution. "Defensively, he's certainly there at short and third," Wilson said. "He's got a little bit more to do at second base, particularly around the bag, which he's very much aware of and focused on. You could certainly play him there at second base in a big league game tomorrow if you could, but just cleaning up a couple little things at second base, that'll be a focus as he hits Triple-A. Really, it just comes down to getting more Triple-A at-bats and more experience." With a hot start, Rodgers could be in Denver well before the All-Star Break. Welker's hitting has long been his calling card, and it won him a California League batting title last year, but his defense is starting to get equal reviews. He'll get a chance to move around the infield this season. "He's going to play some first base," Wilson said. "We focused on that in the fall, in instructional league. He played a couple games there last year. He's played a game out here already in Minor League games, and we'll continue that. This is by no means a position change. This is a position addition." The Rockies signed franchise cornerstone Nolan Arenado to an eight-year contract extension, but that hasn't influenced the organization's plans for Welker. "The signing of Nolan has nothing to do with what we're going to do with Colton," Wilson said. "Whether Nolan signed or not, it would be the same exact path with Colton, which is adding to his defensive repertoire. "The fact of the matter is, Nolan could go down tomorrow and we'd need somebody to play third base. The same held true with [Colorado shortstop Trevor Story]. Story moved all around, and then [Troy Tulowitzki] gets traded. Story goes off in Spring Training, and he's playing his 'natural' position. You just never know." Welker will head to Double-A Hartford to begin the year. "Colton Welker has an unbelievable eye and feel to hit," Wilson said. "He's got bat-to-ball manipulation skills, and he never gets cheated with a swing, either. You combine all that stuff, and that equals a really good future Major League middle-of-the-lineup bat. "The bottom line is Colton Welker can hit. 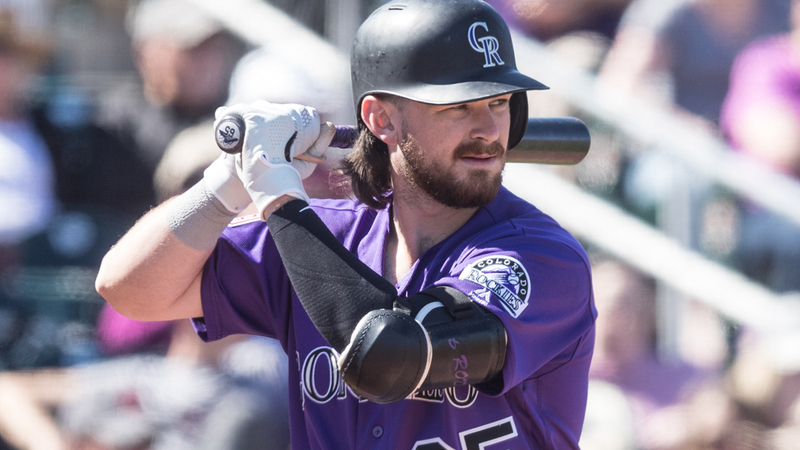 He's always going to hit, and when he's ready to hit at the Major League level, let's give [Rockies manager Bud Black] some options." No position player signed out of a New Hampshire high school has ever made the Major Leagues, but the Rockies feel they have something different with Lavigne, who crushed Pioneer League pitching to a .350/.477/.519 line in his professional bow. While the average and slugging percentage might stick out there -- and carry with them some "Coors"-ian blame among those who want to negate accomplishments in offensive-tilted Grand Junction -- Lavigne's on-base percentage can't be overlooked. The then-18-year-old walked 45 times compared to 40 strikeouts, "making him one of only two out of 45 qualified [Pioneer League] hitters to post a BB/K ratio above 1.00," as Toolshed explained. This year, the young slugger will continue his trek through Colorado's hitter-friendly affiliate parks with a swing through Class A Asheville and could see Class A Advanced Lancaster if he handles the Sally League with ease. Just three years ago, Pint was the talk of baseball, going to the Rockies fourth overall and bringing with him an electric arm that swept triple-digit heat easily. Now, he's a relative unknown. Pint missed all but 8 1/3 innings last year with forearm and oblique issues and has pitched in 37 total games in three years, posting a 5.33 ERA. But he's healthy and at ease this spring, and the Rockies know they don't have to rush him. "He's still 21," Wilson said. "He doesn't have a whole lot of experience, which means he still has a lot to learn. To rush through some process and still have all these expectations of him, that's not the right thing to do. It's not fair to him. It's not fair for people that are working with him. The health thing is probably the No. 1 thing. Just make sure you stay healthy and make sure you get some innings under your belt. Making some sort of great leap forward, I'm not looking for that. I'm looking for him to just take some small incremental steps this year. Hopefully, by the end of the year, that equals a big leap. But I just want him to go out and have fun." Pint spent all of 2017 at Asheville and went 2-11 with a 5.42 ERA in 22 starts. Last Opening Day, he recorded only one out while being charged with five runs -- three earned -- on two hits and two walks before being lifted due to forearm stiffness. Colorado will likely send him there again, hoping the third time will prove a charm. The Rockies still love Pint's 75-grade fastball and a curveball they regard as the best in the system. If he can control his mechanics and harness his command, a potential big league front-line profile is still very much in play. "I think, more than anything, [a healthy season] is going to give him a ton of confidence," Wilson said. "Confidence in this game and in the development game is paramount to guys moving forward." An eighth-round pick out of Texas in 2017, Boswell has gone from a nice surprise to a bona fide prospect in two professional seasons. Last year, the infielder put up a .288/.331/.496 slash line with 17 home runs and 50 RBIs at Asheville and then got even better one step up the ladder at Lancaster, hitting .322/.388/.636 with 10 blasts and 28 driven in over 30 contests. A collegiate second baseman for the Longhorns, Boswell will see more action at third base this year in addition to his natural position, "can play short in a pinch" according to Wilson and may also get some work in the outfield down the road to diversify his utility potential. He's likely headed back to Lancaster to start the season. More to keep an eye on: Right-handed pitching prospect Peter Lambert could've just as easily been this year's "Major League-ready" selection after his climb to Triple-A last year and a five-appearance big league spring that resulted in a 3.38 ERA. He'll join Rodgers in Albuquerque to begin 2019 but will almost certainly make his Colorado debut this summer. … Fellow righty Rico Garcia went a combined 13-9 with a 2.96 ERA in 27 outings for Lancaster and Hartford last year and could make a push for a big league look this season. "He's got weapons to get guys out, and he's got no fear," Wilson said. … The Rockies loved what they saw in nine starts for last year's first-round pick Ryan Rolison. The southpaw, who posted a 1.86 ERA for Grand Junction in his debut season, could follow the accelerated track of fellow Colorado lefty Kyle Freeland, who reached Triple-A in his first healthy full-season campaign. … Corner infielder Tyler Nevin pushed Welker all season long for the California League batting title last year, and he'll join the third baseman in Hartford as the dynamic offensive duo moves up the ranks together.